The production of TV shows, movies or Theatre performances often require some sort of custom jewelry as a prop. Whether or not the custom project is going to be in center stage as in this item, or a side item as in our “Wendy Williams” project, it has to be done in a timely manner and meet or exceed any of the client’s expectations. This was exactly the case with this custom diamond tongue ring ordered by ShowTime. Showtime was preparing an advertising campaign for the new season of their hit serous “The Big C”. 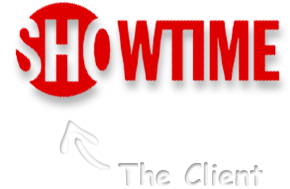 The demands of the client where time sensitive, and because of the lack of experience that ShowTime has with custom jewelry we used our professional services to guide them through the production to great success. 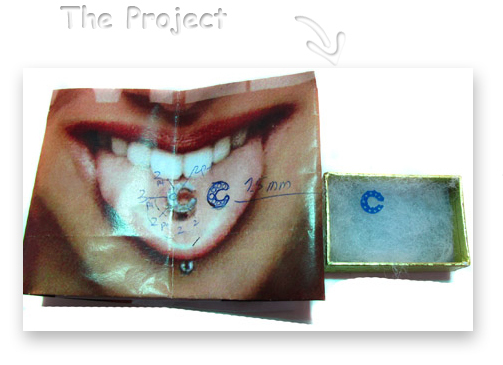 Showtime had already created the finished advertisement with a “photoshoped” diamond C tongue ring (as pictured to the left). What had happened was that Showtime was not satisfied with the way the photoshoped C looked. immediately. The advertisement was the premier focus of their new season and was going to be on billboards across the entire country. 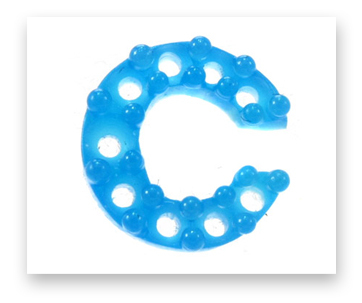 It had to look perfect, so they had decided to create the C and photograph it rather than creating it digitally. This was a last minute decision and they were strapped for time. A diamond c tongue ring might seem like a simple enough project, but that is not case when you are working for an advertisement for a huge show. Everything has to be perfect, shape and font of the C had been reconsidered 3-4 times. That is allot of changes considering the one week production deadline. Using our expertise in we had convinced ShowTime that a C shaped similar to the logo for the show, 1 mm tall 7.5 mm high, pre-set graduated stones was the most intelligent way to go. As for the stem of the tongue ring, we had purchased a standard tongue ring and used its stem to save time and unnecessary work. In the end we had made the tongue ring in two sizes, just in case one was two small or two big there was a back up. This was not requested by Showtime but much appreciated. We care for the final outcome of any transaction, and take any necessary step to ensure the project’s success. The extra effort to make the custom tongue ring had paid off for Showtime. Instead of the fake photoshopped C in the original concept, they got a real life custom diamond jewelry product. The image has been used in magazine adds, on the ShowTime website, and on highway billboards across the country. Hundreds and thousands of dollars where invested into advertisements where our little c was the center of attention. Not bad for a weeks worth of work by the best custom jewelry manufacturer in the world, TraxNYC.